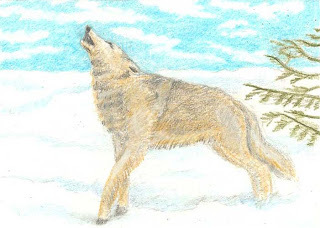 I love wolves, and really wanted to make a drawing of a wolf in the snow. This one is entitled "Young Wolf Snow Singing." And I really wanted the wolf to be "singing." This is, in a sense, a mixed media piece, as I used Prismacolor Colored Pencils and an oil stick. It was my first try at combining these two, and I want to experiment some more, using conte crayon with pencil. Where is his pack? Close by no doubt. Maybe I will show some more of them. Beautiful work, great job in capturing his "singing"
This is wonderful Rae! You really captured the moment! There is a lone black wolf in the forest where I walk my dog. I've seen him twice and others have too. He may be a wolf/coyote hybrid but he is huge! I find wolves intriguing too, I always hope I'll see him, but he's very shy. I love your wolf, Rae! Beautiful work on him and his surroundings! I'm a fan of wolves too and you've caught this one mid-stride and singing too! Wow your wolf singing is gorgeous. I love him. Rae this is fab, you've captured cold and the action of singfing perfectly. I was a lucky person to had a hybird wolf to to have at my side, he passed in 1999.